Tub Farming – You can use your old tubs, pots, buckets, and even recyclable baby pools for growing plants which have about 8-12 inches deep roots. Just ensure that there are holes at the bottom of your container for drainage purpose. Greens like kale, chard and collards can be easily grown in these containers. Wee Tree Wall of Plants – A wee tree wall meets many advantages including taking up excess wall space. You’ll need to use fence posts for planting horizontal planters in between and getting a vertical garden effect. 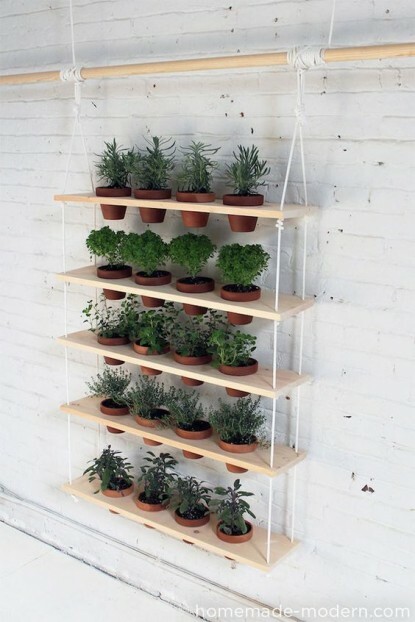 Vertical Gardening – This is a popular way of gardening in smaller spaces such as apartments. Here, plants can be grown vertically on walls or fences. You can use plastic bottles, a hanging shoe rack or ready kits available in the market for gardening. Plants like strawberries, cherry tomatoes, beans, cucumbers and pumpkins grow well with this style. Raised Bed Gardening – Sometimes, gardening requires tilling earth; but there are ways to avoid this extra step. You can create a raised bed by laying down wet newspaper sheets and alternating these with mulch and compost. Over the last layer, you can sow your seeds for plants like potatoes or carrots. Sky Planter – Upside-down planters are especially useful as they enable you to save space and grow plants practically anywhere in your house. Plants are placed in ceramic pots and are watered over top. For apartment renters, the best place to start is to find somewhere to house your urban garden. This can be a fire escape, balcony or patio, or a window sill. Wherever you choose to begin, be sure your urban garden will receive ample sunlight, water, and feasible temperatures.